The Help Center is an opportunity for individuals seeking addiction related services of any kind to engage with said service immediately, and without waiting for their turn on any wait list. All providers who participate in our monthly help center have agreed to this condition. In terms of detox placements, this time of year it becomes much more difficult. Thus far there has been a 100% placement rate, meaning every person who has come through looking for detox has been placed that same evening. While we cannot promise that to be the case going forward, we CAN promise that we will diligently search for open beds throughout the state and will follow up the following day if need be. The ultimate goal still is to place people that evening. There is no way to ensure which facilities will be available on any given day. There are also services there available for concerned family members. For some, this is all new to us, and we don’t know where to start. 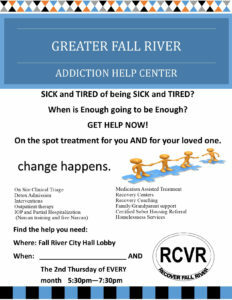 The Greater Fall River Addiction Help Center is a perfect place to start. 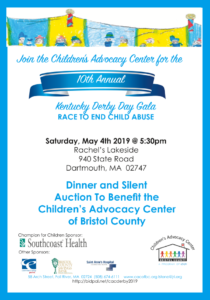 We are staffed by other parents and family members who are dealing with the same situation, as well a by staff who have learned to effectively manage their addiction and volunteer to help others. The best thing to offer an isolated and overwhelmed parent who is dealing with an addicted child is a sliver of hope. In an effort to increase accessibility, we are also operating a Help Center on 12/14, from 1pm to 3pm. 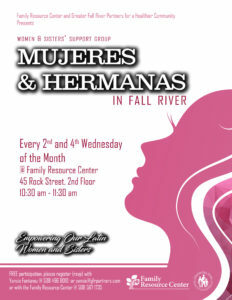 This event willl be held at the new First Step Inn Conference Center.